If your garment has separately worked button and buttonhole bands, you should first pin the fronts to the back at shoulder seams. Then pin The bands to the front, taking care to ensure that the lower’ edge of the garment forms a straight edge One stitch should be taken from the band and the cardigan to form the seam. Reinforced cardigan bands: You can create a really professional finish on a cardigan by reinforcing he front bands with grosgrain ribbon facings. First. pin a facing in place on the wrong) side of each band, taking care not to stretch the knitting. Slipstitch the facings in place, as shown, On the buttonhole band, cut the buttonholes in the facing to match the buttonholes on the garment and work buttonhole stitch around each one using a matching sewing thread. Sew the buttons to the button band in corresponding positions. 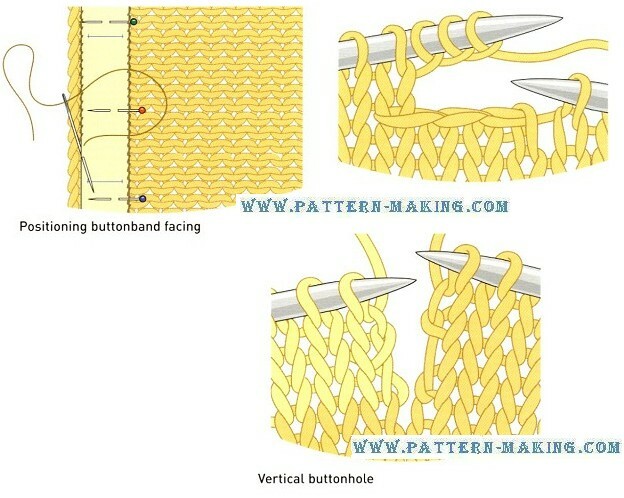 Buttonholes: To knit a horizontal buttonhole, work to the positron of the buttonhole, bind off one, two or three stitches, then work 10 the end of the row. On the next row, cast on the same number of stitches over those cast-off. 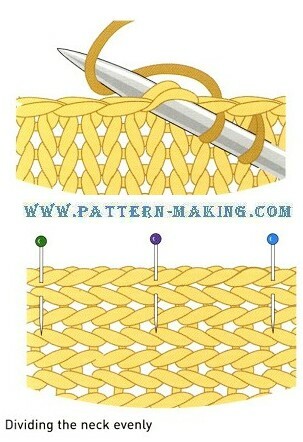 On the following row, pick up the loose thread at the base of the buttonhole. work the next stitch and puss the picked up stitch over it. Horizontal buttonhole: To make a vertical buttonhole, divide the stitches at the buttonhole position and work an equal number of rows on each set of stitches, then join up with a row of stitches worked right across. Joining in new yarn: Whenever possible, Join a new ball of yarn at the beginning of a row, Where a new ball of yarn has to be Joined in the middle of a row, you can make a neat join by splicing the yarn, Unravel a short length of the yarn from the old ball and the new one, and cut away a strand or two from each, Twist the remaining strands together to make one thickness of yarn, Knit carefully through this join,, trimming off any stray ends.